Rayne is a dewy, spring blue metallic with an energizing turquoise metallic flash. 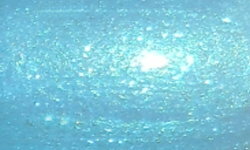 Color: This is a very beautiful icy blue shimmer. The shimmer in this beautiful and so is the color. I don't have a problem with this color in the least bit. I just think for my coloring, it just is a little too icy looking. I think this type of color washes me out sadly :(. Formula: The formula on this is a bit sheer, but easy to use. I used 3 coats above. This one can be a little brushstroke-y due to the frosty shimmer. Price: This is $9 on the Zoya site. Overall: I wouldn't not recommend this color at all. It is a gorgeous shade of blue with an intense and beautiful shimmer. A lot of people found this to be their favorite of the spring collection. This color just doesn't work on me personally. If you find you have a similar experience with pastel and frosty shades then you may want to rethink this color, otherwise go for it!